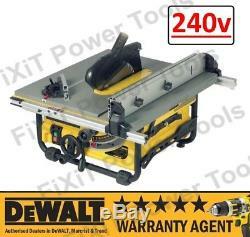 DeWALT DW745 1700W 240V 10 254mm Heavy Duty Compact Table Rip Saw Rework. 22 kg unit weight and optimised footprint make this the most portable saw in its class - Steel roll cage protects saw against jobsite drops and impacts - Rack and pinion fence system, front and rear fence lock and large, clear scales combine to give an extremely accurate and easy to use saw - Powerful 1700 Watt motor for high performance in all applications - Fence system provides 610 mm of rip capacity in a portable design for cutting large sheet materials to size - Cast table top design ensures accuracy and precision - Overload protection system ensures powerful performance in hard, wet or frozen woods - Quick bevel lock with large scale for easy, accurate adjustments. Power Input 1700 Watts - Power Output 1100 Watts - Blade Speed 3800 rpm - Blade Diameter 250 mm - Blade Bore 30 mm - Bevel Capacity -3 to 48 ° - Max. Ripping Capacity [right] 610 mm - Max. Ripping Capacity [left] 315 mm - Max. Depth of Cut at 90º 77 mm - Max. Depth of Cut at 45º 57 mm - Table Size 630 x 570 mm - Weight 22 kg - Depth 742 mm - Length 577 mm - Height 425 mm. 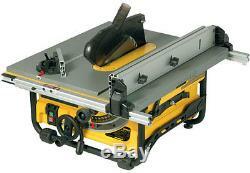 Includes: - DeWALT 745 240v Lightweight Table Saw Rework. Mitre Fence - 2 Bladeners - Parallel Fence - Dust Port Reducer - Push Stick. The item "DeWALT DW745 1700W 240V 10 254mm Heavy Duty Compact Portable Table Rip Saw RW" is in sale since Friday, June 9, 2017. This item is in the category "Home, Furniture & DIY\DIY Tools & Workshop Equipment\Power Tools\Saws & Accessories\Table Saws". The seller is "fixit_power_tools-uk" and is located in GB. This item can be shipped to United Kingdom.